There are trends and buzzwords in guitar gear, as there are anywhere else in society. A few years back, the trending buzzword was ”true bypass”, and the guitar discussion forums were flooded with threads on the subject (What is it? Is my pedal TB? What does it do?) and in addition to writing multiple answers in those types of threads, I also wrote a couple of articles on this site. In at least one of those articles, I mentioned the ”buffer amplifier” as an important part of a guitar signal chain. Basically, the guitar only ”sees” the first cable, while the remaining cables (marked green) are driven by the buffer’s output stage. This means that no matter what you turn on/off later in the chain, the guitar’s frequency response will stay consistent. Do I need a dedicated buffer, then? Not necessarily. If you have an all-true bypass pedalboard, you might. But most of us don’t, and you can often achieve the same effect as in the example above, by simply arranging your pedals to take advantage of their buffers. But that’s not to say dedicated buffers don’t have their merits. Not all buffers in pedals are created equal, and you may find one or two that has a negative impact on your tone. 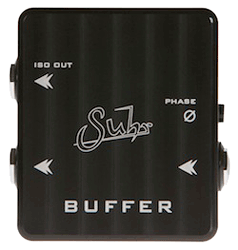 A dedicated guitar buffer is more likely to have a good impact, as it is specifically designed for this purpose. And if you’re thinking about adding a pedal just for buffering (rather than repositioning one that’s already there), dedicated buffers are often quite small and won’t eat up too much pedalboard real estate. Sometimes I see people claiming that a buffer can restore signal that has been lost, and however much I’d like it to be true, it isn’t. A buffer will not bring back treble that has been lost earlier in the chain – it can only preserve it from getting lost further down the chain. At heart, a buffer is simply a 1:1 gain (same level at both input and output) amplifier stage. When placed early in the chain, it takes the place of whatever later input stage (in another pedal or the amp) later in the chain that the guitar pickups would otherwise be connecting to. 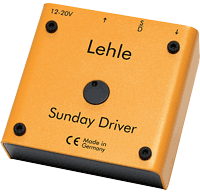 Its input characteristics are designed to be good for the pickups to deal with, while its output characteristics are designed to drive long cable lengths and other obstacles, without loss of treble. Basically, it decouples the source (guitar pickups) from the load (the rest of the chain all the way to the amp). Or rather, it inserts its own load in place of the load the rest of the chain would otherwise pose. This means that any active circuit conceptually functions as a buffer, so if you have a pedal you tend to leave on, it’ll do the job. It may not be ideal for the job, especially tonally, but that’s another matter. What if I have more than one buffer? 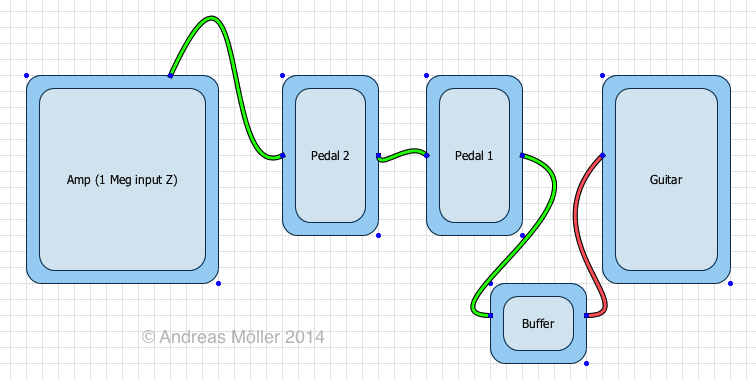 Sometimes I see discussions on whether a dedicated buffer would be beneficial even when there are buffered pedals in the chain. The truth is that it depends on where those buffers sit, in the chain. If you have a buffered tuner (such as a Boss TU-2) first in the chain, adding another buffer after it will not change the way the pickups interact with the chain (as the TU-2 is decoupling them from the rest of the chain). In that case, you’d mostly be adding circuitry that doesn’t need to be there.